Starting off with Google's hardware, the Home Mini is $29.99 ($20 off) with a free $10 Target giftcard. 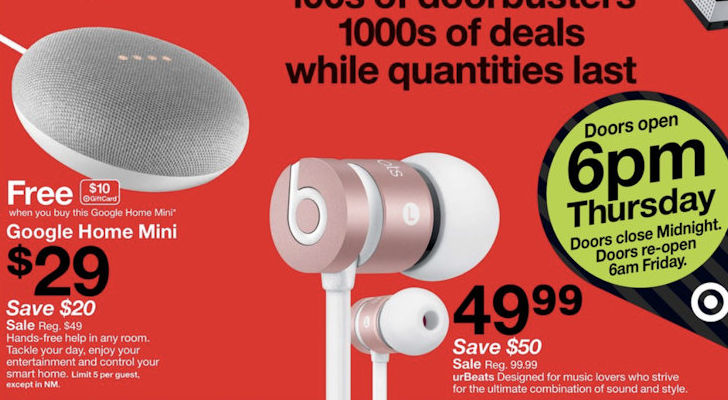 That's a solid discount, and the larger Google Home is $79.99 ($50 off). Both the Chromecast and Chromecast Audio are $25 ($10 off). Though not manufactured by Google, there is at least one Chromebook on sale as well - the 11.6" HP Chromebook x360 for $219 ($80 off). Target doesn't carry Pixel phones, so sadly there is no discount there. 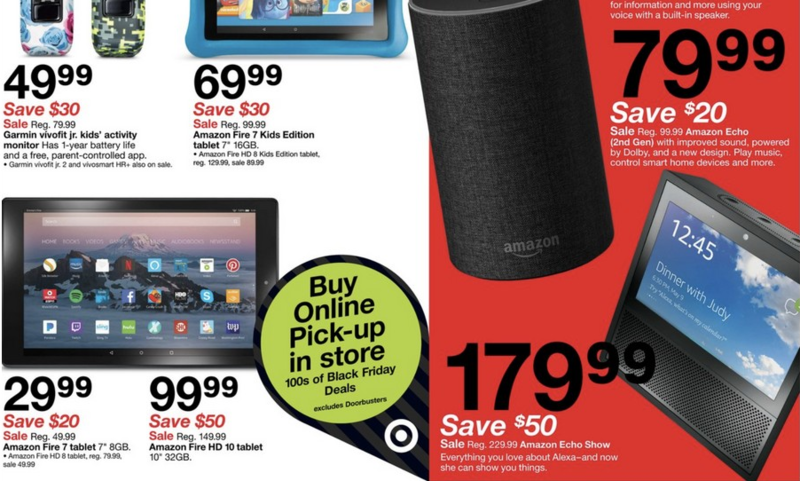 Target has been selling Amazon products for a while, and most of them are discounted here. The previous-gen (not the new one) Fire TV Stick is $24.99 ($15 off), the new Echo is $79.99 ($20 off), the Echo Dot is $29.99 ($20 off), and the Echo Show is $179.99 ($50 off). Moving onto tablets, the Fire 7 is $29.99 ($20 off), the Fire 7 Kids Edition is $69.99 ($30 off), and the Fire HD 10 is $99 ($50 off). I expect these same deals will be offered by Amazon itself. Finally, there are a few discounts on Samsung devices. If you buy and activate a Galaxy S8 or Note8 in-store, you can get a $300 Target giftcard. The Galaxy J3 Luna Pro is also $39.99 ($60 off), and the Galaxy Tab A 10.1" 16GB is $179.99 ($100 off) with a free $20 giftcard. You can browse the ad from the source link below, and I expect we'll see promotions from more stores in the coming days. The ad says that these deals will be valid from November 23-25.